Real-estate sales are booming, with buyers lured by zero down payments and low interest rates. In Vancouver yesterday, 494 condo units sold for $123 million in just nine hours. B.C. Three years ago, on Feb. 21, 2001, a spectacular fire ripped through a row of businesses on Main Street between Broadway and 10th, ravaging a mattress factory, a seafood restaurant and a beef and pork jerky shop. The three-alarm blaze, which took 50 firefighters and 12 trucks to battle, burned so hot that emergency crews had to adopt a “defensive” strategy and move some trucks away from the buildings. However, rising from the ashes is a silver lining in the form of a 42-unit condominium project — scheduled to be ready for occupancy later this year — that is garnering praise in Mount Pleasant for paying close attention to the area’s heritage. “Everyone is enthusiastic about this,” Mount Pleasant Business Improvement Area general manager Martha Welsh says of the project called HUB, which is being built by developer and heritage aficionado Robert Wilson. “Along Main we have full-block massing of buildings and this [HUB] captures that heritage feel of our area. This is bringing back some life to that block and will probably be a really good enhancement to the neighbourhood. And they’ve gone the extra mile with the materials and the design. The building, the first new condominium project developed by Wilson, adopts several of the elements of Main and Broadway’s heritage buildings, particularly with its massing, it’s incorporation of two separate facades (one about 21 metres wide, the other about 15 metres) along Main, and especially its prevalent use of tan-coloured brick, which was used extensively in surrounding structures built at the turn of the 19th century. “We wanted a building that was compatible with the heritage buildings in the area,” says Wilson, whose previous projects include converting old heritage buildings in Yaletown and Gastown such as the old Nutty Club candy warehouse on Hamilton Street to artist live/work spaces — while retaining as much of the heritage aspects of the structures as possible. “We spent a lot of time getting just the right type of brick and window design. And we have two different facades. We didn’t want a mass frontage, because most buildings [a hundred years ago] were about [15 metres] wide. Wilson‘s general manager for the HUB project, Brian Martin, has worked on several other heritage-type projects with Wilson before. Martin says the building isn’t designed to look exactly like a heritage building, citing larger windows that modern buyers appreciate and concrete overhangs that lack the decorative details of older buildings. “We’re not a complete heritage replication,” Martin says of HUB, which is 60-per-cent pre-sold and features such modern amenities as environmentally-friendly bamboo floors, 2.7-metre (nine-foot) ceilings, a common roof-top deck, secured underground parking and a warranty the developer says exceeds government requirements. Heritage expert Don Luxton says the HUB developers were right by choosing to “blend into” the neighbourhood’s heritage, rather than try to copy a heritage building down to the last detail. He says developers shouldn’t try to completely copy a heritage design, because that can lead to gimmickry which would devalue the authentic buildings from the past. “Every building has to be of its own time,” says Luxton. “If it [HUB] is trying to fit in by being a polite neighbour, then that’s good, just so long as it’s distinguished from the original. The project site now is just a massive hole, where the burned-out remains of the 2001 fire have been removed and construction crews are busy putting up the new foundation. Take a stroll near the construction site and you’ll see not only a new shopping mecca in the making, but a collection of older brick buildings that sets the tone for the neighbourhood. On the west side of Main at 10th, for example, is the Belvedere Court apartments, a heritage brick building that HUB will face. One block north at the corner of Main and Broadway are the 1912-era Lee Building and an old Bank of Montreal building, also completely brick. Other nearby housing projects have also incorporated brick into their designs, but not to the extent of HUB, which is being cited as contributing to a renaissance in Mount Pleasant, where trendy shops seem to be sprouting up everywhere. Mark Linklater is a sales agent at the nearby Living Space, a company selling high-end European furniture that moved its operations from North Vancouver and Yaletown three years ago. Wilson says he could have built HUB several floors higher, but chose to stick with four floors to retain the heritage aspect of the structure. HUB, which will have ground-level retail facing Main, will also incorporate a narrow overhang near the roof, a classic element of older brick buildings. 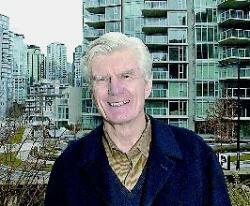 He says a lot of their buyers are looking for an alternative to Yaletown. Bob Adair, the City of Vancouver development planner who worked on the project, says there was great support for the project, particularly because of its design. “The emphasis there is for new developments to be sympathetic to the general heritage character in the area and this seemed like a good opportunity to reinforce that,” he says. 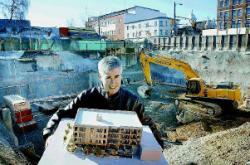 “We didn’t want a full copy of a heritage building there and they [the developer] worked quite hard on a compromise. Adair agrees that the developer could have built higher, but that it would have had to have been concrete construction. Andy Paterson of North Vancouver is the first in line for a chance to buy into some of the $151 million worth of condos for sale in Yaletown Park 1 and 2. An architect’s model (right) shows Peter Wall’s Yaletown Park, 850 units in three towers at Mainland and Homer, as Vancouver’s condo boom continues. Condo-mania has returned to Vancouver, as the lineup awaiting today’s grand opening of two new Yaletown residential towers would attest. In a scenario resembling a Boxing Day sale, people started queuing up Friday afternoon, eagerly awaiting today’s 11 a.m. launch for Yaletown Park. Project marketer Bob Rennie said consumer response has been “so phenomenal and unprecedented,” he expects to sell more than 400 of the 612 available units — totalling about $100 million — on the first day. “I think this will be my fastest-ever sellout,” said Rennie, who sold more than $274 million worth of properties in 2003, a North American record. To ease the anticipated crowd’s hunger pangs, Rennie sent his 21-year-old son, Christopher, and office administrator Jessica Jang to drive down to Seattle early today to bring back 200 dozen Krispy Kreme doughnuts. Longshoreman Andy Paterson was first in line Friday at 1:15 p.m., determined to stay all night in front of the sales centre at Granville and West Georgia so that he wouldn’t miss out. “My wife, Katie, will bring me some extra clothing and relieve me for bathroom breaks,” said Paterson, 54, a North Vancouver resident whose sights were set on a two-bedroom unit on the fourth or fifth floor selling for $269,900. Lech Dolecki, a 22-year-old lifeguard and university student, was second in line, along with his mother, Danusia. Being built by flamboyant developer Peter Wall, Yaletown Park, on Smithe Street between Homer and Mainland, is being marketed as the “last true Yaletown location,” at the “gateway” to the area roughly bounded by Robson, Richards, Cambie and Davie streets. Nearby amenities include the Urban Fare and Choices markets, as well as trendy restaurants such as Cioppino, Circolo and Glowbal, and the Opus Hotel. 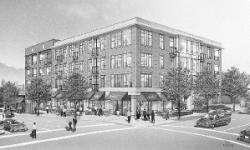 Wall purchased the building site in fall 2002, beating out four other developers for the coveted 2.26-acre property. The $29 million, or $59 per buildable square foot, that Wall paid was considered astronomical at the time, prompting some of his peers to blame him for driving up land prices. The $59 price is now considered to be a bargain — Wall later rejected a $50 million offer for the land — since vacant sites downtown are now fetching prices in the $100 to $150 range per buildable foot. Wall, who in the past eight months has launched construction on more than $400 million worth of condos downtown, said Friday he is passing on some of his lower land cost to Yaletown Park buyers. “Our approach is to continually supply the market with affordable product,” said Wall, chairman and CEO of Wall Financial Corp. He plans to offer a total of about 850 condo units in three residential towers on the Yaletown site, with today’s launch involving the first two buildings, currently under construction and scheduled for completion in late 2006. In the past two months, Rennie built up a waiting list of more than 2,000 potential purchasers. “In my 30 years of selling real estate, this is the biggest response we’ve ever had from young buyers wanting product under $300,000,” Rennie said. Prices for studio units range from $159,900 to $199,900; one bedrooms from $195,900 to $299,900; one bedroom and den from $215,900 to $335,900; two bedrooms from $269,900 to $399,900; and townhouses from $359,900 to $499,900. Each unit includes one underground parking stall, a perk now rarely given in other area projects, with some developers charging an additional $25,000 for on-site parking. Based on the phone enquiries Rennie’s office and sales team have received, Rennie said he expects the buyer profile at Yaletown Park to comprise about one-third investors and two-thirds end users, or owner-occupiers. “What’s driving the market is a combination of low interest rates, consumer confidence and a lack of inventory,” Rennie said. “Every crane [residential project] downtown is already 95 per cent sold. At Yaletown Park, both the Bank of Montreal and TD Canada Trust are offering fixed five-year mortgages at 5.45 per cent. Wall’s latest development is among billions of dollars worth of residential projects currently in various stages of construction in the city’s downtown and waterfront areas as developers try to keep up with a seemingly insatiable demand for new housing. 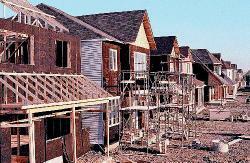 Multi-family units now account for more than half of all construction in the Lower Mainland. Multiple Listing Service figures show 14,843 condo units exceeding a total value of $3.2 billion sold in Greater Vancouver in 2003, compared with 11,967 units totalling $2.365 billion the previous year. Last summer, it took Rennie only 11 weeks to sell all 456 units at Wall’s Electric Avenue condo project in the 900-block of Hornby Street, $104 million worth. In August and September, it took Rennie five weeks to sell all 423 units at the Hudson, at Granville and Dunsmuir, fetching Wall another $101 million. They were just three young guys enrolled in a course called Engineering Science 340 at Simon Fraser University. Students need to come up with an entrepreneurial idea, propose it as though they were dealing with management of a big company, make the product and do a wrap-up report and presentation on it. Chris Mitchell, Matt Brown and Hani Mehrpouyan had an idea. The germ of it came from friends who had tales of woe of having their laptops stolen. Bells went off in the minds of these three 20-something whiz kids. The course was looming. “We bounced ideas off each other all summer before the course started and we kind of impressed the rest of the class by being prepared for it,” said Mitchell. After much brainstorming, mind bending and pencil sharpening, the trio came up with a device that they hope will foil laptop thieves. Their invention comes in two parts — one that is attached to your laptop and the other that you hold in your hand. Step away from your laptop and the palm-held end of the device notifies you if your laptop is being moved. You then have five seconds to either disarm a siren on the other end of the device before it goes off, or let it blare out the news to the whole world that something is wrong. The beauty of the electronic beast, according to Mitchell, is it allows the laptop owner to be mobile, which is, after all, the whole idea of laptops. There are few false alarms because of the deactivating device and the distance required between the laptop and its owner (about 15 feet) before the gizmo works. “There are lots of systems out there that have just a thing that detects motion, so it blasts a siren just like the car alarms that no one listens to these days,” said Mitchell. Sixty-nine per cent of laptop thefts occur when the owners are on the road or in the airport, yet current devices don’t seem to address these circumstances. “All these devices require you to remember to do something when you leave your laptop behind and really there is nothing that protects you when you are walking with your laptop,” said Mitchell. Their gadget caught the eye of judges last fall at the mammoth Telus New Ventures B.C. Competition for early-stage companies. Out of 130 entries, the trio came third, winning $20,000. Friends happily tested it. So did local companies and institutions like Simon Fraser University, PricewaterhouseCoopers, the law firm of Fasken Martineau, the Growth Works venture capital firm and the federal government’s Western Economic Diversification office. The prevalence of laptop theft is difficult to determine. No figures are available for Canada. South of the border, companies reported average losses of $47,107 due to laptop thefts in 2002, according to a survey by the U.S. Computer Security Institute. About 63 per cent of respondents to the survey said they were victimized by laptop thefts in 2002, up from 55 per cent in 2001. The young entrepreneurs figure their device will sell for about $95 when it becomes available for purchase about two months from now. They are currently applying for patents in Canada and the U.S. and hope to use contacts made through co-op work in companies, as part of their engineering studies, to manufacture and distribute it. The three hope to sell a few hundred gadgets to local people and get the interest of early-stage financiers. Then they hope to go to the next level, which is to develop a chip that can be incorporated right into laptops. So do the three have hopes of getting rich? “Hopefully, it will help people and prevent laptop thefts,” Mitchell replied diplomatically. But he has to admit that getting rich would also be nice. Allowing home buyers to borrow as much as 100 per cent of the purchase price will help young people enter the housing market earlier, but they had better be prepared for the added costs of home ownership. The federal Canada Mortgage and Housing Corp. has changed its rules, and beginning next month, home buyers will be able to borrow the minimum five-per-cent down payment rather having to save the money. “This is good news,” said Ed Jackson, a certified financial planner and president of Advocis Greater Vancouver, an association of financial planners. But Jackson said people who take advantage of the new CMHC rules should be sure they can afford the mortgage payments as well as the property taxes, insurance and all the other costs attached to owning a home, not to mention the cost of borrowing the five-per-cent down payment. He also said buyers should be prepared for interest-rate increases down the road. “They will have to qualify to make the housing payments, but it may mean living on a tight budget at the outset,” Jackson said. “But ultimately, it will represent good financial value for the family. While CMHC will allow home buyers to finance their down payment, the agency will charge more to insure these mortgages. With zero cash down, buyers will pay a 3.4-per-cent fee on the mortgage amount. With five-per-cent cash down, buyers pay 3.25 per cent and the fee drops to two per cent with a 10-per-cent cash down payment. For example, with zero cash down, a buyer would pay $6,460 in CMHC fees to buy a $200,000 home with a borrowed $10,000 down payment. The fee would drop to $6,175 if the down payment was made in cash. Most people add the fee to their mortgage amount. CMHC will also require applicants to have an excellent credit rating and a proven track record of making their debt payments on time if they are borrowing their down payment. Marge Robertson, lendingproduct manager for Vancity Credit Union, said lenders will develop loans, cashback plans and lines of credit for home buyers who want to borrow their down payment. Bob Scott, a realtor with Re/MAX Sabre Realty in Port Coquitlam, said first-time buyers will likely be quick to take advantage of the new rules. 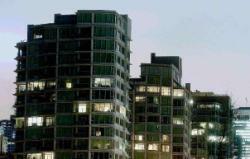 “The market has shifted with the price increases and some people can’t save the money for a down payment,” Scott said. “They can afford the mortgage payments, but they just can’t save the five per cent. Home buyers will be able to effectively obtain 100-per-cent financing to purchase a property under a new initiative announced Monday by Canada Mortgage and Housing Corp.
Up to now, borrowers have been required to come up with a minimum downpayment of five per cent of a purchase price from their own resources, in order to qualify for mortgage insurance. Effective March 1, CMHC is dropping that requirement, allowing the five-per-cent downpayment to originate from any source, including credit card, personal bank loans, other lender incentives, or borrowing from relatives. “The change will enable many Canadians to realize their home ownership dream sooner than what would otherwise be possible,” said Wayne Proctor, CMHC’s director of business development. Borrowers would still need to prove their ability to meet their debt requirements before the federal agency will guarantee the mortgage for 95 per cent of the property purchase price. Young first-time home buyers are expected to benefit most from CMHC’s new guidelines. “I think this move will be very helpful,” said Jessica Jang, a 20-year-old Vancouver office administrator, who has been frantically saving to purchase her own condo. CMHC’s new policy was also applauded by Gord Dahlen, vice-president, Western Canada, for Invis Financial, a leading mortgage brokerage firm. “We’re very excited about it,” he said in an interview. “This is going to give a real shot in the arm to both the housing industry and the mortgage industry. “It will particularly help those young people, professional or otherwise, who have steady employment but haven’t yet been able to raise the five-per-cent downpayment to get into home ownership quicker. With the change, purchasers will be allowed to take advantage of wide-ranging means of financing, while lenders will be able to offer Canadians a variety of mortgage products, including terms as low as six months and fixed, adjustable and capped interest rate loans. Using a $200,000 property as an example, a buyer would still have to qualify for a mortgage representing 95 per cent of the purchase price, plus an insurance premium of 3.25 per cent of the loan if the downpayment is less than 10 per cent. Based on the best five-year fixed rate currently available of 4.4 per cent, the monthly payment on the $196,175 loan, with a 25-year amortization, would be $1,075. If the buyer doesn’t have any of the minimum five-per-cent downpayment and had to borrow, a typical consumer loan of $10,000 at an interest rate of 7.25 per cent (prime plus three) would cost $199 a month over five years. At credit-card interest of 18 per cent, the monthly payment on $10,000 over that period would be $254. However, Invis mortgage consultant Rick Robertson pointed out that virtually every major bank is currently offering a “five-per-cent cash back” plan if borrowers take out a fixed mortgage for a five-year term at the posted interest rate of 5.8 per cent. At 5.8 per cent, the $196,175 loan would cost $1,232 monthly, or $157 more than the loan at the 4.4 per cent rate, a difference of $9,421 over 60 months. But a five-per-cent cashback payment amounts to $9,808, or $387 more in the consumer’s pocket. “A borrower would then only have to come up with a couple of hundred dollars of the $10,000 downpayment,” Robertson said. At 1710 Bayshore Drive, at least eight Americans own condos, along with five people whose main residence is in Hong Kong. There are also owners from London, England, Heidelberg, Germany, and Dubai in the United Arab Emirates. A couple of blocks away, the luxurious Bauhinia (535 Nicola) has owners from San Francisco, Denver and Santa Fe, New Mexico, as well as Hong Kong, China, Taiwan, Switzerland, Mexico, Germany, Austria, and Monte Carlo. Down the street at The Carina, 1233 West Cordova, international owners from Hong Kong, Mexico City, Hiroshima and Reading, England, mix with Americans from San Francisco and Campbell in California, Orlando and Gainsville in Florida, Austin and The Woodlands in Texas, Denver, Tucson and Annapolis, Maryland. The catch is, they don’t live here. Like London, Paris or New York, Vancouver has become a place where the well-to-do like to have pieds-a-terre. These aren’t properties that are bought as an investment and rented out. They may well be good investments, but in many cases, they sit empty when their owners are away, which is most of the time. If you walk around the new developments at Coal Harbour at night, you’ll find that in many buildings, several floors are dark. Sometimes, more than half a building is dark. The same can be said for some waterfront buildings on the Concord-Pacific development, or on Beach Avenue. Check out the condo tower with the tree on the roof at 1919 Beach: most of the time, only three or four storeys are lit at night. Developer Michael Geller thinks there are positive and negative aspects to the phenomenon. “I would say overall it’s good for the city,” said Geller, who lives in one of the Bayshore towers. “From a financial point of view, we have a lot of people who are paying a lot of taxes and yet they are placing very, very limited demands on services. One of Geller’s neighbours is former Vancouver mayor Art Phillips. He acknowledges there are dark suites, but doesn’t think it’s a huge percentage. “There’s a lot of people [in Coal Harbour towers] who live in two places throughout the year,” said Phillips. “Then there are some to whom this is a very occasional place to come to. Most of them are regulars who come in the summer and go somewhere warmer in the winter. It’s just like many people in Vancouver have a place in Palm Springs or Phoenix. This is the reverse. The city’s co-director of planning, Larry Beasley, said Vancouver doesn’t have an official position on the large number of foreign property owners. But he thinks it’s part of the city’s growing internationalism. “It’s not a trend that is causing me a great deal of worry,” he said. “Usually that pied-a-terre also represents a linkage which may have a variety of business, social, family or personal connections into the city, that helps to connect the city to the rest of the world. Foreign ownership in Vancouver is nothing new. The Lion’s Gate Bridge was built in 1937-38 by the Guinness brewing family in Britain, which wanted to develop its extensive land holdings in West Vancouver (i.e., British Properties). In recent times, there was a huge controversy in 1988 when Asian developers offered False Creek condos for sale in Hong Kong before they went on the market in Vancouver and they sold out before any locals had a chance to bid. There are still plenty of offshore owners who bought before 1997, when Hong Kong residents worried about the looming takeover of Hong Kong by China seemed to be buying property all over the city. Retired promoter Hugh Pickett lives across the street from two houses owned by offshore interests that have been vacant for years. “Nobody lives in them,” he said. “Gardeners come once a week and do the garden. One house now has two kids going to a private school. The other house has nobody at all. Trying to get a hard figure on just how many absentee foreign owners there are in Vancouver is tricky. Assessment rolls sometimes list foreign owners, but foreign owners also may keep local addresses, or own them through a company. In any event, realtors say the offshore Asian market dropped off when China kept the status quo in Hong Kong after it assumed control in 1997. The foreign buyers now tend to be Americans and Europeans, who usually buy downtown. Canada Mortgage and Housing Commission figures show that since 1992, 16,175 new condo units have been built in the downtown peninsula. CMHC’s Cameron Muir said a CMHC study found that 47 per cent of downtown condos built in the 1990s were sold to investors, but many of those were local buyers purchasing one to three units. Realtor Bob Rennie says Americans tend to go for the high-end suites in prime locations. This is borne out in property assessments: you tend to find more American owners in pricier suites, like a Seattle resident who has a $4,785,000 penthouse at 1777 Bayshore Drive. “Down on the water, America wants front row seats,” Rennie said. Rennie said trying to quantify European buyers is harder. Rennie is currently selling Shaw Tower on the waterfront, which will be the tallest building in the city when it is completed. The 25 per cent U.S./10-12 percent European average is holding true. “Out of 132 units, I have four left,” he said. Rennie also sells a lot of condos in Seattle, which is probably more like Vancouver than any other city. But he said there isn’t a big pied-a-terre market in the Emerald City. “I find that America moves around a lot more, and America moves around to stay closer to their grandchildren … ,” he said. Why is Vancouver attracting international buyers? Because it’s beautiful, it’s cosmopolitan, and it’s safe. 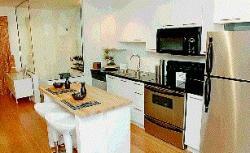 Geller recently sold an apartment in the Bayshore development to a couple from Florida, who use it six months a year. “They come up here because they like the climate, especially in the summer,” he said. “They like the urbanity, they like the clean air, they like the absence of crime, they love the proximity to the outdoors. Realtor Evelyn Froese also says Vancouver is something of a bargain, by international standards. “If you’re looking at international people, if they’re comparing to international prices of major cities, Vancouver is still very favourably priced,” said Froese, who has been selling suites at the Bayshore project in Coal Harbour for several years. International buyers also like Vancouver‘s proximity to Whistler, one of the world’s biggest ski resorts. In a sense, downtown Vancouver is also a resort city for international buyers and tourists. “I think we are perceived as a resort city, in terms of what we’re offering,” said Froese. Beasley rejects the resort concept. “I’ve heard that characterization before, and I’m not buying it,” he said. “The reason I’m not buying it primarily as a resort is because of what I know as the linkages that are occurring in this city on a business and personal basis, to Asia, to Europe, etc. With the Olympics coming, international interest is probably only going to increase. “The Olympics put a spotlight on our city,” said Rennie, who thinks foreign ownership will “definitely” increase in some areas. Geller does house exchanges with people from other parts of the world on his holidays. “We have found is that there is a great deal of interest from people all over the world wanting to do a house exchange in Vancouver,” he relates. When a Port Coquitlam couple bought their home two years ago, they didn’t find out until after they signed the deal that the house had been used as a marijuana grow-op. She and her boyfriend discovered all the vents had been sealed off in the basement where they suspect the plants were grown. They have spent $25,000 on renovations, including rewiring the house. “And you can smell mould in the house even now,” she said. The couple didn’t insist upon a subject-to-inspection clause because there were seven or eight other people interested in the house, she said. Maria suspects the owner, whom the couple never met, and his real-estate agent knew about the basement pot factory. If the couple were informed, they could have bailed or negotiated a better price on the $232,000 asking price, which they paid, she said. “I feel I was cheated here somehow,” she said. Under new rules by the B.C. Real Estate Association announced last week, sellers are required to declare on the standard disclosure statement if the house had been used to grow pot or make crystal meth. But those in the industry say that won’t necessarily protect consumers and homebuyers who they say should always have an independent inspection done. Realtor Carmen Maretic, a leaky condo advocate, said the unwitting buyer of a grow-op faces the same risks as when buying a condo that may have had water damage. VANCOUVER – B08Vancouver council has crafted a unique strategy for developing the former Woodward’s store by proposing to sell it to one of four short-listed developers while retaining control over the project by being a participating investor. That will allow the city to shape the project to fit certain social goals, guarantee the developer financial stability by investing whatever it gets as a purchase price back into the building, and give the city some space it can provide to non-profit groups. As well, it has had preliminary talks with the federal government to work out an agreement where the federal government would agree to match the amount of space the city takes in the new building. The developer for the former department store, once the heart of downtown Vancouver and now seen as a key to revitalizing the socially scarred Downtown Eastside, will be chosen from among four companies that were shortlisted in a report going to council Tuesday. The four, chosen from 10 original applicants: are Concert Properties, financed by union pension funds; the Holborn Group, which owns the rest of the property on the Woodward’s block; Millennium Properties, a high-end housing developer; and Westbank Projects, which recently developed the Shaw tower and the city’s first 200-metre tower. He said he’s also very happy with the decision to have the city act as a participating investor in the project, rather than selling it outright with no controls, or trying to develop the project by itself. “It’s the best of all possible worlds,” he said. “The city doesn’t have any risk” yet it is able to maintain a significant amount of say in how the project develops. Green said councillors debated all the pros and cons of selling outright or developing the project alone, but ultimately people were unanimous about the “relatively custom-made” solution of having the city sell it but retain an interest by buying back part of the project. If the city can get $10 million to $11 million as a purchase price — approximately double what it paid the provincial government for the vacant store almost a year ago — that would give it at least a 10-per-cent stake in the project, which has been estimated to cost anywhere from $70 to $100 million to develop. Besides selecting four developers to proceed to the next stage, where they submit more detailed proposals, the city will also embark on a lengthy set of consultations with the public, its own urban design panel, heritage advisers, and other participating groups to set out the basic framework for the project. Developers will be asked to submit two designs, one that provides the 180,000 square feet Simon Fraser University would like to have, and one without. That’s in case SFU is unable to complete the fund-raising to carry that off, says Mike Flanigan, Woodward’s project manager. They will also have to work with two other major clients, Army & Navy and Vancouver Community College, to incorporate them into the design. The city is expecting to award the project to one successful bidder July 20. Affordable Housing, the largest social-housing non-profit in the city; Columbia Housing; and PHS Community Services, which operates a number of buildings in the Downtown Eastside for the hard to house. House inspectors can tell in a flash if they are dealing with a home that used to be a drug factory. Witzke said rarely a week goes by when he doesn’t inspect at least one former grow-op. “It’s rampant out there,” he said. The B.C. 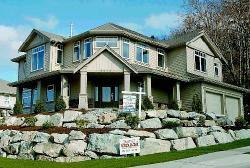 Real Estate Association this week will decide whether to adopt a proposal by B.C.’s two largest groups of realtors — the boards of Greater Vancouver and the Fraser Valley — to include on the standard seller’s disclosure statement a reference to whether the house has been used to grow marijuana or produce crystal meth. “It’s considered a latent defect,” said Amanda Malone of the Greater Vancouver Real Estate Board. House inspector Clayton Abney said he’s inspected about 80 grow-ops in the past three years. “We see all sorts of things, like when the apparatus is still in the house,” he said. He and Witzke said they report what they find to their clients and it’s up to them whether they want to use the information to negotiate the price or to bail out. Lawyer David Grieg said the new drug disclosure, if approved, won’t be much help to homebuyers. “I don’t think the new disclosure will offer any fresh protection in law,” he said. He said buyers can best protect themselves by having the house checked out before signing the deal. You are currently browsing the Les Twarog Vancouver Real Estate and Condo Blog blog archives for February, 2004.